The Stratego Gravon Championship 2018 starts at 01 of April 2018. Organisation is managed by flame04, Henry, Major_Nelson und Overlord. As of now players can register via the Gravon Forum. Within the next days we will add a page with all detailed rules. In case of any questions please use the forum to contact the Tourney-Organisation. We wish you lots of fun and success! is at our Club Rummikub homepage. The Malefiz-Single-Tourney 2016 starts at 16th October 2016. Eligible are all players, who are registered and not prohibited. Immediately you can register for the tournament : Registration. The tournament starts on 05.30.2016 . We wish all players a lot of fun. 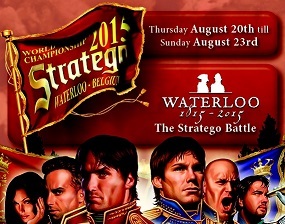 From Thursday August 20th till Sunday August 23rd 2015 the 18th World Championship of Stratego will be held in the Town Hall of Waterloo. Exactly 200 years after the famous Battle of Waterloo (1815), we will relive the Battle with our own Napoleonic pieces. Knowing our beloved game of Stratego is based on the Napoleonic era, we cannot think of a more suitable location for the 2015 World Championship. Malefiz-Team-Tourney 2015 starts at 12th April 2015. Eligible are all players, who are registered and not prohibited. Announcements are possible up to now at the forum. For the first time the Rummikub WC will be held in Berlin at the Ritz - Carlton Hotel. The tournament runs from 07th till 11th of November. Players from 32 Countries will join the tourney and only the National Champ is qualified to play for his country. German players can qualify at the German Championship in Sept. 2015. More Information about the German Rummikub Tournaments follow. We hope a lot will join the tourney and wish all lots of success! 2010-01-23: Starting from now all players can order T-Shirts or other merchandise articles from your beloved gameside. You find all information at the forum (link to gravopedia). if you need a new cagoul, a wonderfull polo-shirt or other stuff, why not with your gavon nick? in addition you can add for free a 50 character text. we offer all for a net cost price, but please ask for shipping costs first. 2009-10-14: New on Gravon: Rummikub can be played online now on Gravon. Good skills in combining tiles and a litte bit of luck are necessary to win this awesome family game. Have a lot of fun with this new game. You find the Rankings for Rummikub here. Gravon is a virtual world, where players can play board-and cardgames together without charges. The virtual world consists of many rooms, where you can play different games. When a group of players comes together, they search for a room, where their game is offered. It is also possible to watch those games. The only thing, you need, is a Java-supporting Browser like Netscape or Internet Explorer. With this it's no problem to enter Gravon. If you have never been at Gravon before, please read the introduction. If you know the ropes at Gravon, please take a look at commands. There are useful tips. To enter Gravon, you have to connect port 1168 at server www3.gravon.de. There is also the opportunity to use the website-channel. In this case Gravon will run slower, but therefore the connection supports every Firewall. Depending on your browser's configuration, you may need to install java.